In an exclusive interview with Gaia Discovery, Joanne Reed - owner and managing director of PicknBin LLC - shares her motivation behind the design and marketing of a unique eco-friendly product: PicknBin Clean-up Kit that encases biodegradable bags and wet wipes in an easy-to-carry wallet for carrying trash and treasures alike. By Mallika Naguran. Joanne Reed: Manufacturing and use of biodegradable bags like PicknBin will decrease countries’ dependence on fossil fuels by conserving resources. What moved you to think of this unique green product as well as to design and patent it? The inspiration for the PicknBin product came to me whilst walking my dog Louis. I keep thinking: “I wish I had with me some poopy bags and some wipes that I could carry easily in one pouch/wallet.” I did a search online to see if I could find and buy that type of product, but found out that you couldn’t find that type of product anywhere. My younger daughter Alize said to me: “Mummy if you can’t find it in the shop you just have to make it yourself.” I thought: “That’s not a bad idea.” So, it started as an idea, then it evolved into a concept to finally come out as a product. I never thought of myself as being a creative person (I can’t draw or paint. I don’t play any musical instrument. I can’t even sing!) but slowly when I started thinking about the concept and the design I realised that the whole process was very creative, and I discovered a new side of me. I had so many ideas floating around in my head all the time that I decided that I have to materialise those ideas and turn them into something real. The thought that you are creating something worthwhile from scratch is what kept me going all along despite all the difficulties. Picking up after your dog is probably the most unpleasant aspect of owning a dog. Anything related to poop sounds unpleasant, dirty, repulsive and downright disgusting. When I designed the PicknBin Kit I wanted to use light colours on purpose in order to step away from the black or dark green colours used in most poop bags. I wanted to create a feeling of freshness & cleanness. It was also very important for me to use bags made from natural materials that will biodegrade. PicknBin handy wallet with five bio-material bags and five wet wipes. So the whole idea of the design was to move away from the concept of something unpleasant, dirty and repulsive to something that is hygienic, clean and green. Plus, easy to carry and looks chic at the same time. PicknBin Poopy Bag & Wipe has transformed the activity of picking up after your dog from an unpleasant to a hygienic, clean and green activity. In terms of the patents I have exclusive Intellectual Property Right on the original product and that includes three Design Patents & a Utility Model Patent; I have also filed a Patent Cooperation Treaty application that gives me Intellectual Property Protection in more than 140 countries worldwide. I am a lawyer by profession, so thinking about legalities comes naturally for me. Also, I am conscious of the fact that Intellectual Property Rights are usually the most valuable assets of most corporations. Are you waging a war against plastic bags? I don’t want to be at war with anyone! What I am trying to do is to raise awareness, try to get people to change their habits and start a movement. I don’t think it is realistic nor feasible to ban plastics bags altogether. The reason plastic bags are so popular is because plastics are incredibly versatile, cheap and convenient. Plastic bag pollution is a huge issue in many countries. What people need to realise is that there are the “good types” of plastic and there are the “bad types” of plastic. The “bad type” is the one that is derived from propylene a chemical component of petroleum, which will make it nearly impossible to biodegrade safely in the environment. The “good type” of plastic is made of biomass and are sourced from natural materials such as corn starchi.e. bioplastics. This type will biodegrade within a few months in the right type of environment, if disposed of properly. Studies have shown that compostable biobased bags help to increase the amount of biowaste collected and improve the quality of compost. Take the US plastic industry for example, it accounts for about 10% of the country’s total oil consumption. The problem is that despite widespread public outrage about the harmful environmental impact of plastics, only a tiny fraction of produced plastics is recycled. It is also worth noting that the manufacture and consumption of biodegradable plastic bags made from natural materials remain a tiny fraction of the overall global market of the plastics industry. Plastic disposables continue to choke coastal areas such as this picnic spot in Tanah Merah, Singapore. Image: NUS ToddyCats. Currently what we have is a linear based economy of take, make and dispose; this in return waste a huge amount of materials, energy and labour. Now is the time for people to start looking proactively into alternatives. The idea is to replace the consumption of oil-based plastic bags and replace them with biobased ones instead. It is possible with the technology that already exists to create new circular systems that conserve resources, reduce pollution, promote efficiency, while promoting at the same time economic agricultural growth, jobs creation and eco-friendly development. Our PicknBin Campaign promotes the message that people should embrace all creative possibilities and all alternatives out there to minimize their own impact on the environment with innovative waste solutions. What kind of pollution happens when we do not pick up after our dogs? PicknBin bags are made of corn stalk, wheat straw, rice straw and sawdust. Instead of plastic, the PicknBin bag is made of natural materials. Where is it made? The PicknBin bag is made of corn stalk, wheat straw, rice straw and sawdust, hence the bag will decompose within months when discarded. The first generation of the PicknBin Kit was manufactured in Korea. 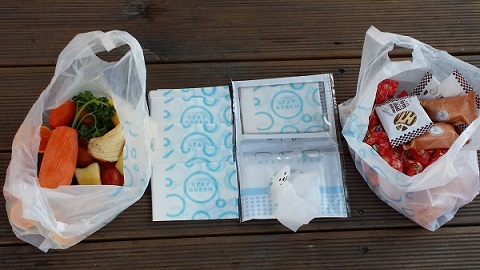 The Picknbin wallet contains five bags (for your trash & treasures) and five anti-bacterial wipes. Manufacturing and using biodegradable bags make perfect sense from an economic perspective. The manufacturing and use of biodegradable plastics will decrease countries’ dependence on fossil fuels by conserving resources while promoting rural economic agricultural growth, job creation and eco friendly development. PicknBin looks pretty versatile. In what ways can this green kit be used? PicknBin started as a pet product, but we are now moving towards positioning it as a multi-purpose cleanup kit. The usage possibilities of the PicknBin kit are endless. It is ideal to have when you are travelling around in a car, on a plane, in train or on a bike. For sure you will find it very useful to have to clean your hands, cleandirty tables/surfaces, clean fruits before eating them, clean any kind of mess and use the bags for all the trash. So it is really handy to have when people are out and about. Many uses of PicknBin loopy biodegradable bags and wet wipes. Also if you like trekking, fishing or any kind of outdoor activities, there could be times when you will find yourself in remote areas where there will be no shower or toilet facilities, so having a PicknBin kit on hand will help you stay clean, fresh and ready to go. For mothers and fathers with babies, for sure you will have some wipes with you when you are out and about, but will you also have with you a bag to carry the dirty nappy? We leave it up to people to use it however they want to use it. There will come a time during their daily routine when they will find the PicknBin kit useful to have. There is a “Usage Section” on the website and we invite customers to send us pictures of the various and original ways they themselves used the kit. We want (through our website and Facebook page) to give our followers a platform where they can share ideas, express their views, and share pictures of their countries for our photo library. We are encouraging customers to keep a PicknBin Kit with them wherever they go in their hand bag, backpack and car glove compartment, so that they will always be prepared. It helps people be spontaneous and do spontaneous things. Alize records "Letter to the World" song, now on YouTube. You’ve great videos on PicknBin. Tell us more about the song Letter to the World! and the voice behind the song. More than a product PicknBin vision is also to spread a message and create a movement. I thought that if I have an important message that I would like to share that I should do it through an original song. To me, music has a universal language that goes beyond geographical and language barriers. Music also touches people on an emotional level. I just happened to know Simon Adams - a school teacher during the day and a musician, composer, song-writer and producer in his spare time. So I talked to him about the theme and the key message that I wanted in the song. In no time he wrote the song. The next thing was to find someone to sing it. That was the easiest part. My youngest daughter Alize has a passion for music. So in no time she was in Simon’s home studio recording the song. And this is how the song “Letter to the World” was born. Who are you marketing your eco-friendly product to and what challenges are being encountered? The first generation of the PicknBin Kit is sold online from the PicknBin website. Most of our stock/inventory is currently located in the US. The North America market has been a primary focus for me; but I am very interested in getting more exposure in the Asia Pacific region. The challenges have been many but the most difficult challenge is to take this concept to the next level. I believe that there is real potential behind the idea; but in order to do that successfully, I need to find investors who will be ready to put their full weight and financial support behind the project. What kind of partnerships and networks are you hoping to build? If I can work with the right partners I believe that we could take this concept to the next level. (ii) to licence the PicknBin invention in order to manufacture, market and distribute it overseas and bring the product closer to the local communities. Who can join the Fan Club? Anybody can listen to the song free of charge by going onto the website. If people want to have their own MP3 copy of the “Letter to the World” song together with the lyrics they can purchase it for $1 by clicking on the “Buy It now’ button on the PicknBin homepage. Currently there are four PicknBin Fan Clubs: Korea, Okinawa (Japan), Reunion Island (France) and USA. Those Fan Clubs were created in honour of the people from those countries who purchased and downloaded the song. Our photo library features some of the most beautiful pictures from those countries. We invite fans to send us pictures of their own countries and if their pictures make it to our library we will send them some free PicknBin Kit samples. If we have more fans from other countries joining in by downloading the song, their countries can also be added to the list. If we have more than 100 purchases/downloads from a country we will then open a new PicknBin Fan Club in honour of this country. I am hoping with the help of Gaia Discovery to be able to open a new PicknBin Asia Pacific Fan Club soon! The idea of sending personal MP3 copies of the "Letter to the World" song and lyrics was to give some fun material to children whose first language is not English to practice the English language by learning the lyrics, studying the message through those words and singing along. I invite any schools and English teacher out there to download the song to make it available to their students. What is your philosophy about living the clean and green life? My philosophy is this: “Small things count. Don’t wait for some big hero organisations to change the World for you. You are the changes you want to see in the World”. Thank you for this interesting interview, Joanne Reed. Now Gaia Discovery readers, do click here to know more about the PicknBin bags and wipes. Or visit the PicknBin website to order a pack today! Watch another PicknBin video - Don't Leave Home Without It! Picture credits: Plastic bag trash - royalty free. Plastic trash by the tree in Singapore - NUS ToddyCats. All the rest - from PicknBin LLC. Older PostProf Lye Lin-Heng: Why Attend the Sustainable Development Goals Conference 2016 in Singapore?